It’s easy to start to live with the little things as they come up. When you face a small change or challenge, you adjust and move on. However, some changes merit a response. You may think that you’re able to live with a condition like tooth loss, but you may not realize what you’re actually giving up. You don’t have to suffer through the pain and dietary adjustments (or potential long-term consequences) necessitated by extensive tooth loss. You can regain your teeth structure and the appearance of your smile with partial or full dentures. The structure of your teeth provides many benefits that you don’t think about until that structure is gone. The most obvious benefit of structure is that it allows you to chew and eat food. While this is important, you also need the structure of your teeth to keep your other teeth in alignment. When you lose one tooth or many teeth, your remaining teeth may start to shift into the vacant areas. That can lead to problems with your bite and unsightly, misaligned teeth. Your dentures are fabricated using precise measurements of your mouth so they will repair the missing structure. In addition to the functional benefits provided by dentures, this prosthetic also rebuilds the appearance of your smile. The damage done to your smile and the self consciousness that you feel as a result can be the most difficult part of tooth loss to deal with. Everyone deserves to have a smile that gives them confidence. When you choose dentures to recover from tooth loss, that’s exactly what you’ll get. 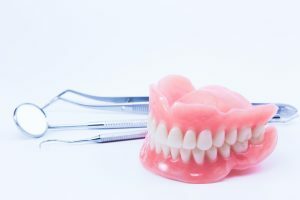 Dentures can be used to replace an entire set of teeth, but partial dentures can also be fabricated to repair more sporadic tooth loss. In any case, you don’t have to suffer through the effects of tooth loss. The team at Cedar Dental can rebuild the function and appearance of your teeth with a set of custom dentures. To schedule an appointment for a consultation, contact Cedar Dental in Cedar Rapids, IA at 319-364-7108.